UC Berkeley scientists have discovered simple CRISPR systems similar to CRISPR-Cas9 — a gene-editing tool that has revolutionized biology — in previously unexplored bacteria that have eluded efforts to grow them in the laboratory. The new systems are highly compact, befitting their presence in some of the smallest life forms on the planet. If these systems can be re-engineered like CRISPR-Cas9, their small size could make them easier to insert into cells to edit DNA, expanding the gene-editing toolbox available to researchers and physicians. “These are particularly interesting because the key protein in these CRISPR systems is approximately the same as Cas9, but is not Cas9. It is part of a minimal system that has obvious potential for gene editing,” said Jill Banfield, a UC Berkeley professor of earth and planetary sciences and of environmental science, policy and management. In CRISPR-Cas systems, the Cas protein is the scissors. When targeted to a specific sequence of DNA, the Cas protein binds and severs double-stranded DNA. The new discovery nearly doubles the number of simple and compact CRISPR-Cas systems potentially useful as laboratory and biomedical tools. “The important thing here is that we found some of these CRISPR systems in a major branch of the bacterial tree, opening the door to a whole new world of microbes that are not cultured in the lab, so we don’t really know what they are and what their habits are,” said co-author Jennifer Doudna, a UC Berkeley professor of molecular and cell biology and of chemistry and a Howard Hughes Medical Institute investigator. Both Doudna and Banfield are faculty scientists at Lawrence Berkeley National Laboratory. The team also found the first CRISPR-Cas9 system in some of the world’s smallest microbes: a nano-scale member of the archaea, which is a sister group to the bacteria. The variety of uncultivable bacteria has only recently been recognized, in large part due to Banfield and her lab colleagues, who use metagenomic analysis to explore microbial diversity in exotic environments, from toxic pools in abandoned mines to the soil in Superfund contamination cleanup sites and the guts of premature infants. The majority of all bacterial life on the planet is basically unknown because these organisms cannot be cultivated in lab dishes, probably because they are symbionts and rely upon other microbes for nutrients needed to survive. One of the new CRISPR proteins, dubbed CasY, was discovered in a massive group of recently recognized bacteria — what Banfield calls candidate phyla radiation (CPR) and which may contain half of all bacterial diversity — that live in geysers and in soil several feet underground. Another new one, CasX, was found in bacteria from known phyla living in groundwater and sediment. The two groups of nanoarchaea found to contain CRISPR-Cas9 were first described by Banfield from acid mine drainage. Banfield, Doudna and their colleagues reported the findings today in the journal Nature. The new CRISPR systems were found by scanning metagenome databases Banfield and her team have acquired over the past 15 years, in search of gene sequences similar to the sequences that code for the Cas9 protein. The database contains thousands of microbial genomes, the majority uncultivable bacteria and archaea. Because the team was looking for CRISPR systems that use a single effector protein so they would be smaller in size, they looked for microbial genomes lacking accessory proteins used by some CRISPR systems in bacteria. The CRISPR system was discovered in bacteria several decades ago, and many biologists worldwide have contributed to understanding its function. Banfield was one of the first to realize that it represented a primitive immune system that protects bacteria from viruses. As is now known, bacteria that survive a viral infection stick a piece of the viral DNA into their own genome as a reminder to be on the lookout for the virus should it attack again. These many pieces of viral DNA are lined up in the bacterial genome, separated by short identical bits of DNA, in a unique area called CRISPR, which is an acronym for clustered regularly interspaced short palindromic repeats. Bacteria then make RNA transcripts of the viral DNA, attach them to cutting enzymes called Cas (CRISPR-associated proteins) and send them out to rove the cell interior in search of viruses. When the Cas-RNA complex encounters a virus with DNA complementary to the RNA, the Cas protein binds and cuts the virus’s DNA, killing it. Banfield first brought this system to Doudna’s attention 10 years ago, and Doudna — a specialist in the structure and activity of RNA — teamed up with Emmanuelle Charpentier in Europe to discover how the Cas-RNA complex worked. Their key insight was that this simple microbial system could be re-engineered to cut not only viral DNA, but any DNA, including the DNA of humans and other eukaryotes. Their retooled system became a precise DNA scissors that has revolutionized basic biological research, allowing scientists to knock out and often replace single genes, and promises to make gene therapy to cure genetic disease a reality. Some 40 percent of cultivable bacteria and most archaea are thought to use CRISPR-acquired immunity, but the majority of CRISPR-Cas systems use a complex array of Cas proteins to cut viral DNA. What made Doudna and Charpentier’s system work so well was that Cas9, isolated from the bacteria Streptococcus pyogenes, was relatively simple, and the two teams re-engineered the system to make it even simpler. Last year, another compact CRISPR-Cpf1 system was discovered different, pathogenic bacteria, Francisella novicida. 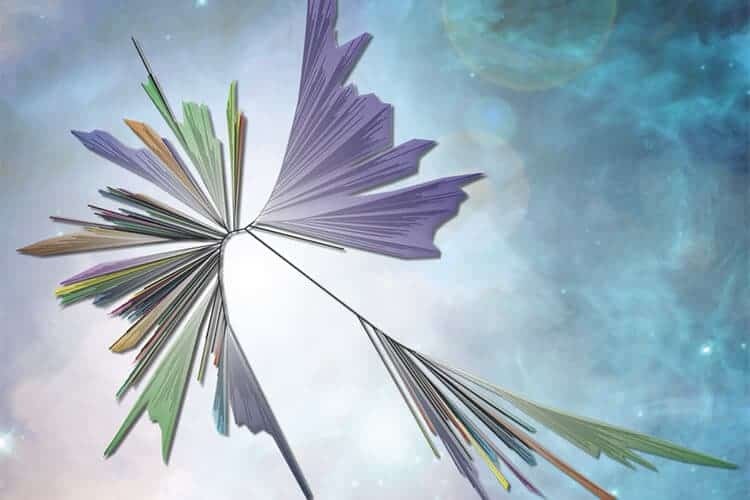 An artistic representation of the Tree of Life, with the many groups of bacteria on the left, the uncultivable bacteria at upper right (purple), and the Archaea and eukaryotes — which includes humans — at the lower right. To date, only three compact Cas proteins — called Class II systems — have been experimentally shown to cut DNA: Cas9, Cpf1 and C2c1. A fourth, C2c2, cuts RNA, while a putative system, C2c3, may cut DNA. Banfield notes that as the database of uncultivable microbial genomes continues to expand, she expects to find not only other variants of the CRISPR-Cas system, but also other proteins with unusual functions that may prove useful in the lab or clinic. Co-author and UC Berkeley staff member Brian Thomas added that these proteins and systems also find application in emerging biotechnologies. “In the last year, we have reported this unimaginable diversity of organisms that we know nothing about and which seem to be filled with proteins of unknown function. I suspect there is an unimaginable treasure trove of other proteins and systems and biochemistry that is still waiting to be found in these organisms,” Banfield said. UC Berkeley researchers in Doudna’s lab subsequently recreated the CasX and CasY systems in E. coli bacteria and found that the systems protected the bacteria, which do not normally have an active CRISPR system, from transformation by foreign DNA. Doudna and her colleagues, including those in the campus’s Innovative Genomics Institute, which she directs, are investigating how the two systems work biochemically, with hopes of creating a gene-editing tool complementary to CRISPR-Cas9. Authors in addition to Banfield, Doudna, Burstein and Thomas are UC Berkeley graduate students Lucas Harrington and Steven Strutt and postdoctoral scientists Alexander Probst and Karthik Anantharaman. This work was supported in part by a Frontiers Science award from the Paul Allen Institute, the National Science Foundation and the Lawrence Berkeley National Laboratory’s Sustainable Systems Scientific Focus Area, which is funded by the U.S. Department of Energy.